Phase 2 of the relationship begins a little while after Cooper has solved the murder of Laura Palmer. He is on the brink of leaving town, saying his good-byes at the Sheriff's Station, when he is confronted by Agent Roger Bryson accompanied by an RCMP officer, Mountie King. Bryson is with Internal Affairs. Apparently, King contacted the FBI after Cooper's gung-ho rescue of Audrey in Canadian territory (aka One-Eyed Jack's). Besides violating jurisdiction, King was running a sting operation. One day, claims King, he was on the brink of busting Jean Renault, and the next, his case is gone. Battis and Blackie are dead, and Jean Renault is gone. As are a stash of drugs they were using in the operation. The implication is clear: That Cooper took the drugs. Cooper takes it like a man, and calls his supervisor, Gordon Cole, for help. Cole sends help, in the form of an old friend of Coop's, a DEA agent named Bryson. Bryson, Cooper tells Harry and Hawk, was a good man. They apparently worked together in a sting in San Fransisco. However, Bryson has apparently changed a bit since Coop last saw him. He now prefers to be called Denise. After some initial shock on the part of Coop, Harry, and Hawk, they get down to the business of trying to clear Coop's name. It is a task that starts to look a lot tougher after it is revealed to we the audience that Mountie King is working with Jean Renault to frame Cooper. King plants cocaine in Cooper's car. And Renault is also working with Hank Jennings, an ex-con, and Ernie Niles (the man who was a cell mate of Hank's and is married to Norma Jennings' mother...), to deal drugs across the border. After the drugs are found in Cooper's car, it becomes apparent that it's going to be harder than they thought to clear him. Meanwhile, back at the Great Northern, Audrey is rapidly recovering from her near-death experience, and runs into Bobby Briggs several times. Bobby wants to work for Ben Horne, and wants a meeting with him. After being thrown out a couple times, Audrey goes in, and gets Bobby an audience. Ben throws him out again, but Audrey is there, and she dusts him off. Bobby, greatful, offers to take her out to ice cream, and she accepts. "Cup or Cone?" he asks. "Cone," she replies, "I like to lick..."
Later, Bobby returns and, using a tape he has that implicates Ben in the arson of the mill, gets Ben to give him a job. Ben gives him a camera and tells him to tail Hank Jennings. Jennings recently betrayed Ben, and Ben wants some revenge, even though Ben is, at this point, slipping out of sanity (thanks to having his brothel taken over by Jean, himself arrested for Laura's murder, and his lawyer dying). Bobby tails Hank, and gets pictures of Hank, Jean, Ernie and Mountie King discussing drugs at a farm outside of Twin Peaks. Cooper himself seems to be taking this all somewhat calmly. He contacts a real estate agent and says he'd like to look at some property around Peaks, thinking of retiring there. The agent takes him out to Dead Dog Farm, an enchanting piece of real estate, where Cooper finds tire tracks, and traces of a white powdery substance. While Coop is on his field trip, Audrey is eavesdropping on a conversation between her father and Bobby. She has a secret passage behind her father's office where she comes to see his business dealings. Bobby tries to give the pictures to Ben, but Ben has snapped, and begins raving at him. They both end up leaving the office. Thinking that the picutres are important, Audrey takes them. Bryson confronts Ernie Niles, who cracks like an egg and agrees to help them out by taking Bryson (who will pose as a *male* buyer) up to Dead Dog Farm to meet with Jean and King. They hook him up with a wire, and then go up to the farm. Cooper is allowed to go after being deputized by Harry. As Coop, Harry, and Hawk watch, Niles proceeds to sweat so profusely that his wire starts smoking. Cooper trades himself for Bryson and Ernie, and ends up as Jean's hostage as the state police gather outside. Jean explains that Cooper has to die because he is responsible for the death of Jean's brothers, and for the death of the drug trade in Twin Peaks. Before this can happen, though, Agent Bryson, in the guise of a waitress, is allowed to come in with dinner. He starts to hike up his skirt, revealing a gun, which Coop takes and kills Jean with. His name is finally cleared. But even now he is not all together safe. While Cooper is saving his career, Audrey is trying to save her father. Despite the fact that her father has done some awful things to her in the past, she is determined to salvage their reltaionship anyway she can, and that includes trying to pull him back to reality when he loses it completely. Ben sets up a huge "battlefield" in his office, dresses up in Confederate garb, and begins to reenact the Civil War as General Robert E. Lee. Audrey calls in Jerry and Dr. Jacoby, and enlists Bobby to help her bring him back. After a very short conversation with Jerry, in which the idea of keeping him in 1863 is soundly squashed ("I've read Daddy's will. If he's incapacitated, it all goes to me when I'm old enough. And he is incapacitated, and I am old enough. So you'd better help or the only project you'll be developing is selling baseboard heaters at the local cash n' carry." "What's happened to the man is a tragedy..."), Dr. Jacoby determines that the only way to bring him back is to allow him to "win the Civil War". Dressing in Civil War garb themselves, they recreate Appomattox Court House, with Dr. Jacoby as General US Grant, Bobby as Ben's bugle boy, and Jerry and Audrey as the farm owner and his daughter. After a great deal of history lesson ("I knew you in the Mexican War, do you remember?") Jacoby gets Ben to sign the surrender, and Ben reverts back to the real world. But this time, he is changed. He smiles broadly up at his daughter, and it is obvious that he is going to try much harder (and that doing a better job with his daughter is part of that). As for Cooper, upon returning to the station the night of Dead Dog Farm, they discover a body sitting behind Harry's desk, it's finger pointing to a place on the chessboard, a pawn in its mouth, and a wound in it's abdomen that is identical to the one Cooper recieved from Windom Earle all those years ago in Philadelphia, the night Caroline died. There are no clues, and just enough evidence to make Cooper sure that it was Earle (the man's name is Eric Powell, Powell, being Caroline's last name). Cooper carefully explains to Harry and Hawk that Windom Earle was his ex-partner, and that Earle went insane after wounding Cooper and killing Caroline. He also mentions that he and Caroline were in love, and that Carolinew as Earle's wife. There is real danger here now, and Cooper tells Harry "You don't know what he's capable of... you don't know!" Meanwhile, Shelly Johnson has problems of her own. Leo had been shot by Hank Jennings around the time that Audrey was entering the brothel. Shelly refused to testify against him (Bobby told her not to, so now they can get the insurance money), and brought him home. He is in a vegetative state, and spends most of his time spitting and sitting in his wheelchair. About the time that Cooper and Truman are discovering Eric Powell's body, Leo is deciding to wake up. He attacks Shelly, who stabs him in the thigh, causing him to run away. Later that night, he is wandering aimlessly through the woods, trying to find a place to shelter himself (his brain really was quite damaged by the gunshot, he isn't quite thinking clearly). As he wanders, he stumbles upon a cabin. He enters the cabin seeking shelter, and instead finds a man sitting behind a chessboard, working from the light of a lantern. The man smiles at him and leans into the light, inviting him to come in and get warm. 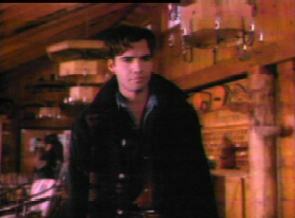 "My name," he says, "is Windom Earle..."
Cooper, meanwhile, has to simply wait out Earle's next move. Earle is playing a "deadly game of chess" where each piece lost will result in another murder. He enlists the help of Pete Martell, the local chess genius, and fills the sheriff's station up with chessboards in order to come up with a stalemate that will not result in any more deaths. [insert deal about white mask] While he is playing Earle's game of cat and mouse, Earle is preparing for the moment when he will be able to take the queen. Using disguises every time, he visits the three most beautiful young women in Twin Peaks, Audrey (in the library), Donna (at her house), and Shelly (at the diner), giving them each an envelope that contains a third of a piece of paper with a poem written on it (which he earlier had Leo transcribe for him), and telling them to meet at the Roadhouse later for a "Gathering of the Angels". And meet they do. They put the poem together, and are confused. Until I get this finished, you can go on back to my links pageand putz around on the web.